I seriously cut the top of my finger this morning and am having a really hard time typing, so this is gonna be short. Always the top of my finger on the hand that I write with. Grrr…. This salad is inspired by one that I saw Nancy Fuller make on her show Farmhouse Rules. I don’t watch a lot of TV during the day, but if it is on, it is always on the Food Network. I love to watch people cook. And I always get new ideas or am inspired by something that I saw on a show. Just like this salad. 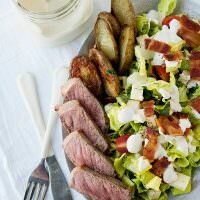 Nancy’s didn’t have steak and she actually tossed the salad so that the potatoes and salad were coated with dressing. But it looked so good, that immediately after watching the show I went to the store and bought the ingredients and made it for dinner. It was worth the trip to the grocery store. I loved this salad (and so did my boys). P.S. Steak is the hardest thing to photograph. Ever. Scrub the potatoes and slice in half. Place in a 9×13 pan. Cut the root off of the garlic heads and break apart. Scatter over potatoes. Drizzle with olive oil and season with salt and pepper. 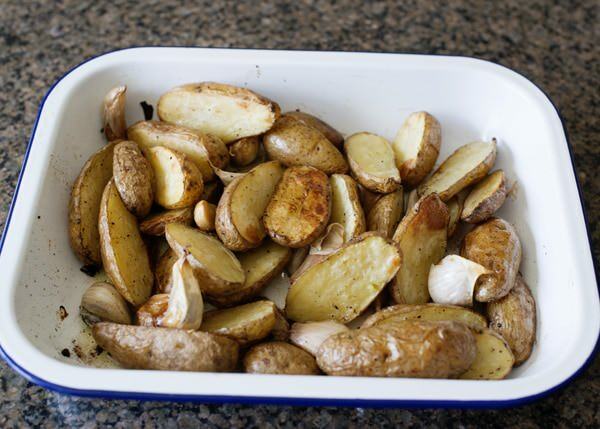 Roast in a 400 degree oven until the potatoes are tender and the garlic is soft, about 40 minutes. Take the garlic out and let cool. 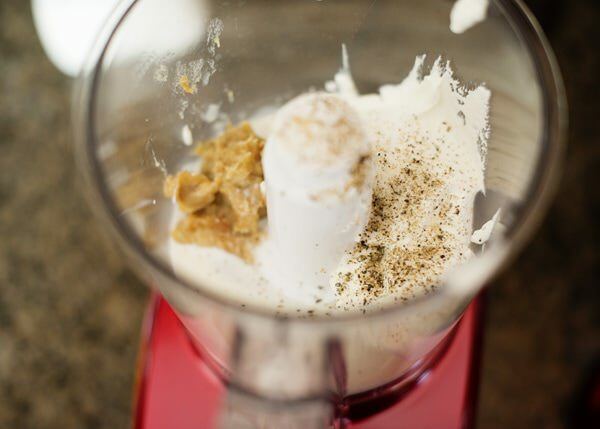 Squeeze the garlic into the bowl of a food processor. Add the sour cream and buttermilk. Season with salt and pepper. Pulse until smooth. Pour into a bowl and chill until ready to serve. Halve the tomatoes, and cut the cheese (ha,ha,ha) into small cubes. P.S. 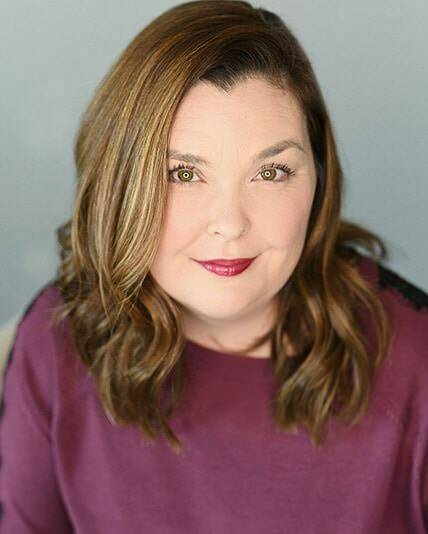 How old am I? I live with a lot of boys, I can’t help myself. Chop the herbs. Make sure that the oven is still on, and at 400 degrees. 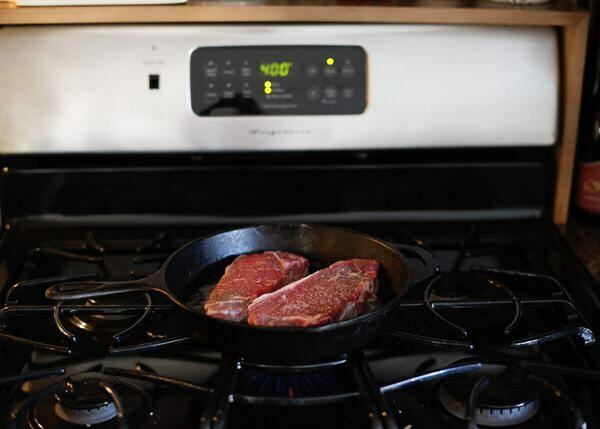 Heat a cast iron skillet over screaming hot heat. 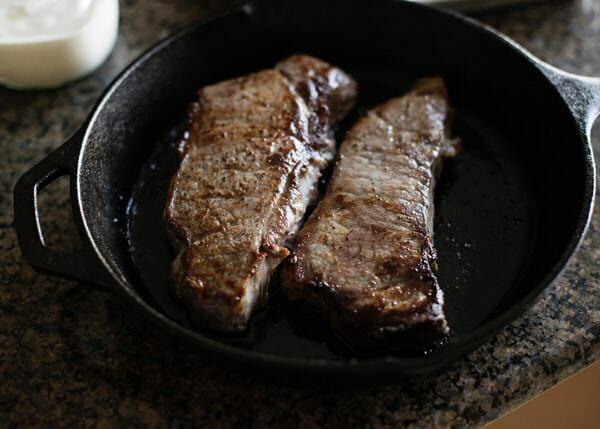 Dry the steaks with paper towels and season with salt and pepper. Add the olive oil and butter to the pan. Add the steak and leave it alone. Resist the urge to move it around. Let it cook for 3 minutes, it should form a nice brown crust. Flip over and place in the oven to continue to cook. I like mine medium, so about another 5-7 minutes. Take out of the oven and let rest for 10 minutes before slicing. 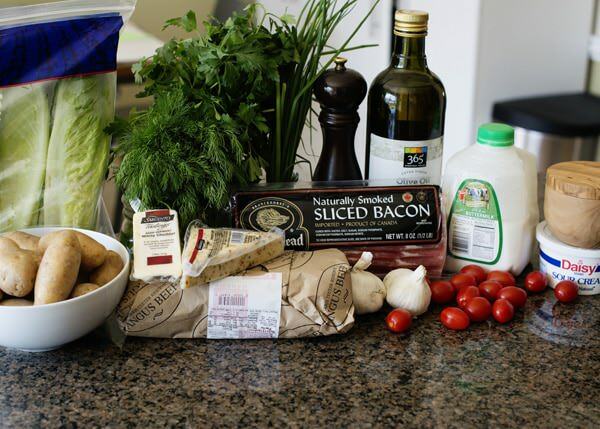 Assemble the salad, line a plate with romaine, add bacon, tomatoes, herbs, potatoes, and drizzle with dressing. Top with steak slices. Scrub the potatoes and slice in half. Place in a 9×13 pan. Cut the root off of the garlic heads and break apart. Scatter over potatoes. Drizzle with olive oil and season with salt and pepper. 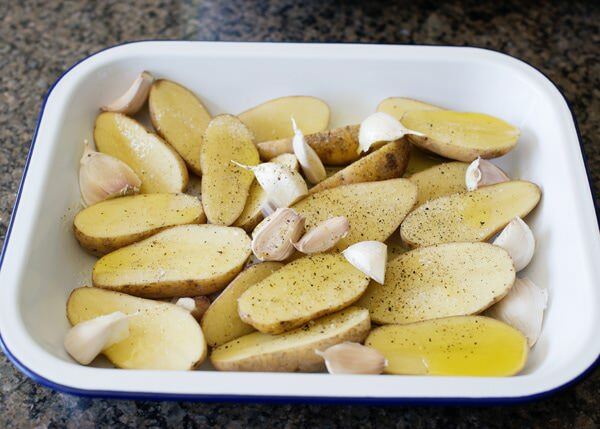 Roast in a 400 degree oven until the potatoes are tender and the garlic is soft, about 40 minutes. Take the garlic out and let cool. 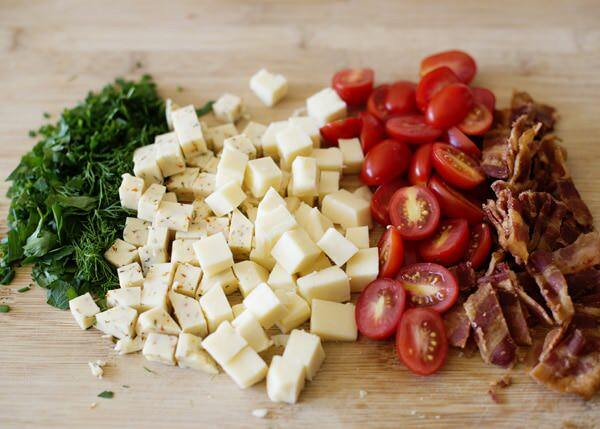 Halve the tomatoes, and cut the cheese into small cubes. Chop the herbs. Make sure that the oven is still on, and at 400 degrees. 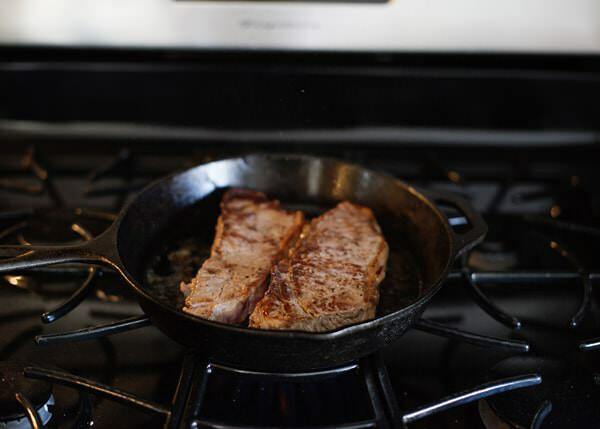 Heat a cast iron skillet over screaming hot heat. 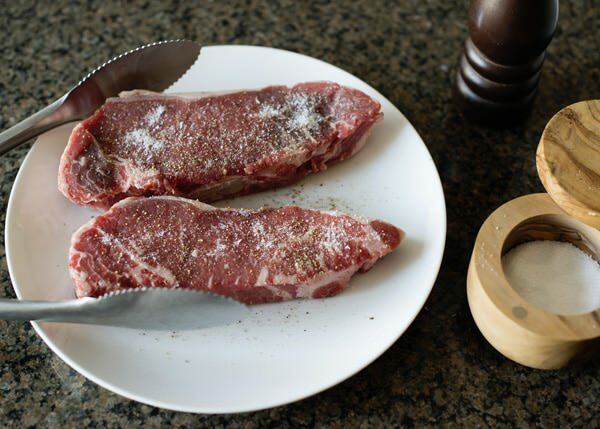 Dry the steaks with paper towels and season with salt and pepper. Add the olive oil and butter to the pan. Add the steak and leave it alone. Resist the urge to move it around. Let it cook for 3 minutes, it should form a nice brown crust. Flip over and place in the oven to continue to cook. I like mine medium, so about another 5-7 minutes. Take out of the oven and let rest for 10 minutes before slicing. 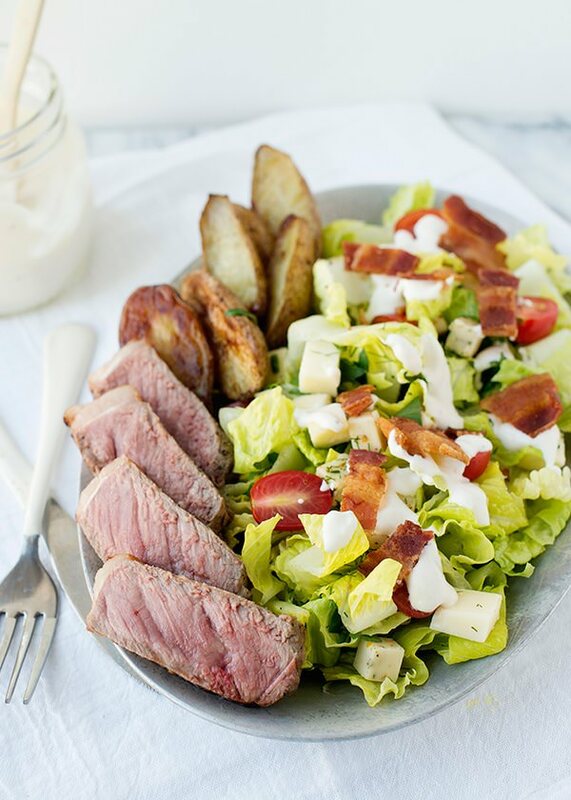 Assemble the salad, line a plate with romaine, add bacon, tomatoes, herbs, potatoes, and drizzle with dressing. Top with steak slices. I love this Bree! What a delicious hearty salad!! Yum, you have the best recipes. I can’t wait to try this one for tomorrow nights dinner ! Thank you so much, that is so nice to hear! 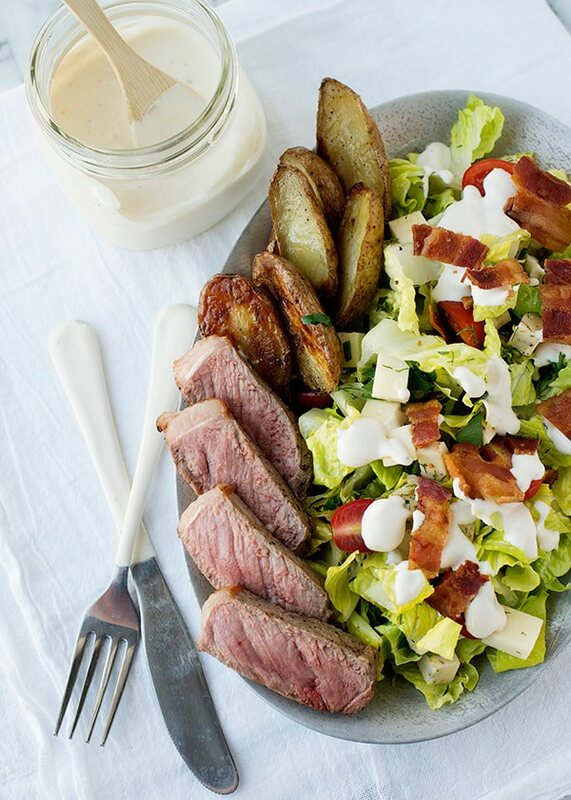 Wow… a salad with steak and potatoes. Now THIS is a salad my family would be happy to see for dinner 🙂 Just discovered your blog – nice to meet you! Nice to meet you too! Welcome! And yes, a steak and potato salad. Always a good idea. This is beautiful. Now I know what I’m making for dinner tomorrow. Thank you Joshua! This was a delicious dinner. This recipe is perfect for summer entertaining! We make a similar garlic dressing and have a suggestion: Try adding a splash or two of Worcestershire sauce, it adds a little zing that complements the beef really well. 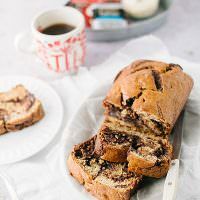 Thanks for sharing this creative, simple, and company worthy recipe!